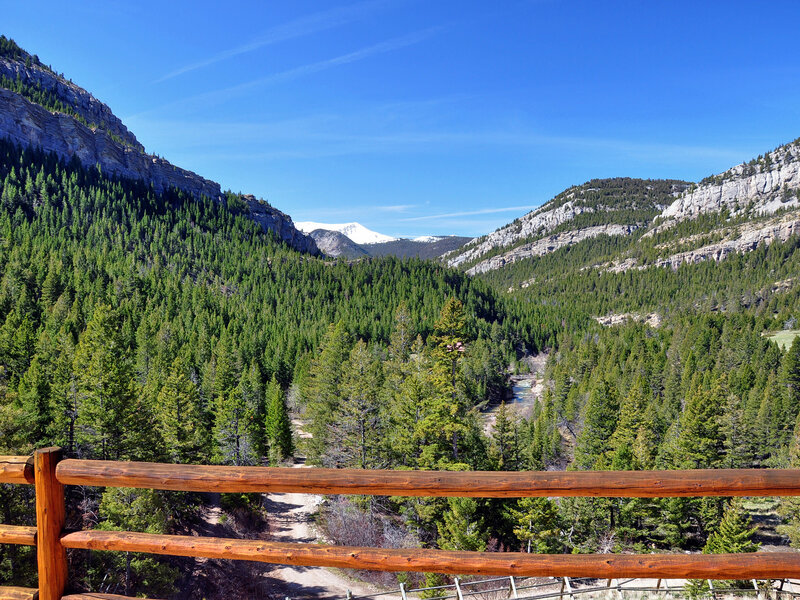 Dearborn Canyon Overlook is nestled in the pines above the crystalline waters of the Upper Dearborn River on a promontory that captivates the senses with stunning alpine vistas and the roar of the river cascading through the canyon. 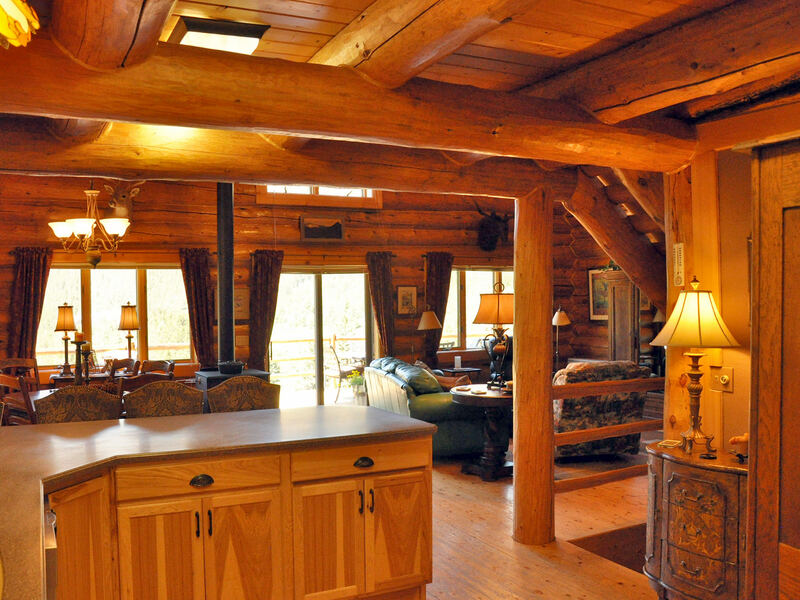 Complementing the tranquil alpine environment, a beautiful handcrafted log home sits on 20± deeded acres that share a boundary with the Lewis and Clark National Forest and adjoining Scapegoat and Bob Marshall Wilderness Complex – over two-million acres of some of the most pristine forest and wilderness in the United States. The Property sits in the Dearborn Canyon at the foothills of the striking Rocky Mountain Front to the west and the vast grassy prairies rolling to the eastern horizon. The Dearborn River and the Rocky Mountain Front provide a magnificent backdrop for the Dearborn Canyon Overlook. The summit of Steamboat Mountain rises to over 8,297 feet in elevation to the north and the summit of Twin Buttes rises to 7,335 feet in elevation to the south. Individuals desirous of escaping to the cool summer evenings and temperate summer days to enjoy hiking, horseback riding, fishing and hunting in a premier location will appreciate the opportunity Dearborn Canyon Overlook provides. Several attractive locations exist to construct a small set of working corrals to maintain several saddle or pack horses for the summer months. With limitless hiking and trail-riding opportunities out your back door, the next owner will enjoy years of exploring the back country of the adjoining National Forest Lands and Bob Marshall Wilderness Area. Dearborn Canyon Overlook is further enhanced by over 850’ of private Dearborn River frontage accessed from the Property. A short stroll through the woods to the river places you in a scenic paradise next to pristine waters – a wonderful location from which to enjoy fishing in the deep pools and runs populated with cutthroat and rainbow trout. Located in the heart of some of the country’s finest flyfishing, the Property not only offers anglers private access to miles of the Dearborn River but also an easy day trip to the trout-rich Missouri River and other nearby waters. If the setting itself is not enough, the improvements to the Property are exceptional. A private locked gate frames the entrance to the tree-lined driveway and leads to an impeccably maintained log home that has been masterfully constructed in a very carefully chosen setting. From the deck of the 4,000 square-foot home, the views of the river and the surrounding mountains are nothing short of breathtaking. 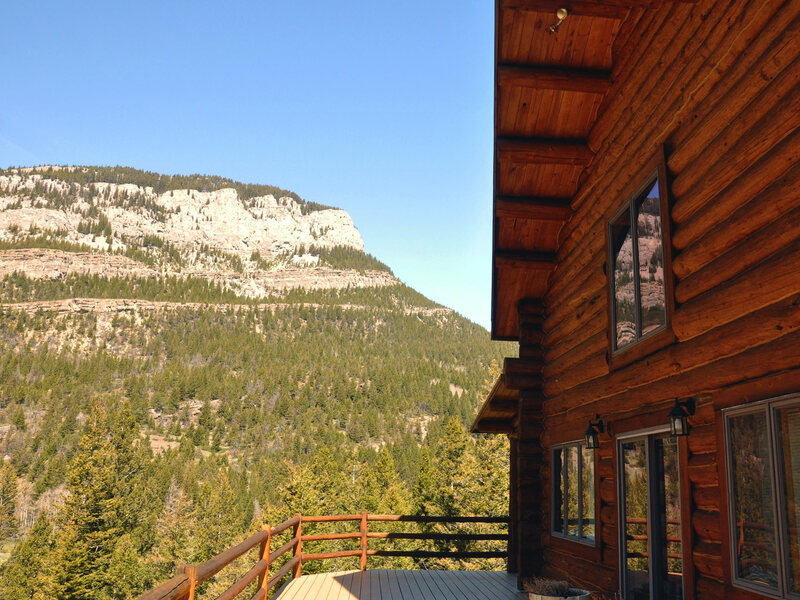 Dearborn Canyon Overlook is indeed a true gateway to wilderness, and is ideally suited as an alpine retreat or a full-time residence for the buyer seeking mountain solitude in one of Montana’s most unique and beautiful locations. 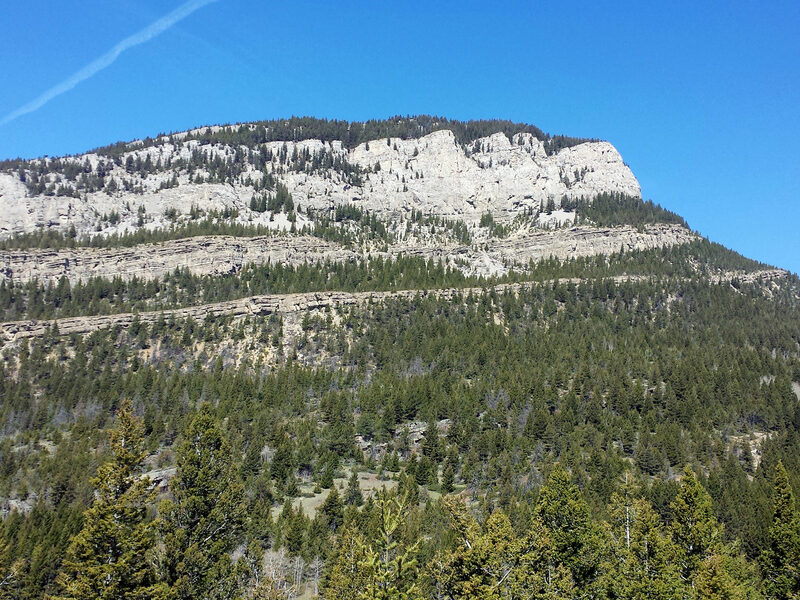 Dearborn Canyon Overlook is located in Lewis & Clark County 23 miles southwest of Augusta, just 6.6 miles past the junction of Montana County Road 435 and Dearborn Canyon Road– a well-maintained gravel county road. Augusta is about a 45 minute drive northeast of the Property, and Great Falls, the third largest city in Montana, is a comfortable 1¾ -hour drive from the Property. Driving from Great Falls to the Property, take Interstate 15 north to State Highway 200 at Vaughn. Follow Highway 200 west to Simms where the highway divides and bear west on State Highway 21; then slightly south on US-287 towards Augusta. Drive south out of Augusta on Highway 435 for about 15 miles to the Bean Lake Junction. Take a right onto Dearborn Canyon Road and follow for approximately 6.5 miles. The Property is accessed through private locked gates. Augusta offers limited services which include a gas station, grocery store, post office and several cafés – a classic Montana ranching town. Choteau, the Teton County seat, sits about 40 minutes to the north and provides a larger range of services. A well-maintained public airstrip is situated on the northeast edge of Choteau. Located at an elevation of 3,942′, the 75′ x 5,000′ asphalt runway is in good condition. Communications for this facility are available through Salt Lake City at Frequency 133.4/285.4 (Great Falls RCAG). Families can expect their children to receive a high-quality kindergarten through high-school education at Augusta Public Schools. Students attend from the surrounding community to experience the unique environment of the small-sized multi-grade classrooms. The high school is classified as a Class C school (under 160 students) by the Montana High School Association and provides a great learning environment and competitive interscholastic-athletic programs. School bus service provides round-trip transportation for elementary and high-school students in the area. The Augusta community has traditionally been very supportive of the school system and has historically supported school bonds for capital improvements and upgrades. Helena, the state capitol of Montana with a population of 63,395 (greater-Helena area), is located just east of Continental Divide and the Helena National Forest. The nicely restored historic downtown, located in the beautiful setting of Last Chance Gulch, includes an outdoor walking mall with unique shops, eateries, boutiques, and coffee shops. There are multiple opportunities to explore the history of the city including touring the Capitol Building or the Original Governor’s Mansion, taking a ride on the Last Chance Trains and Trolley, or touring the 1905 Cathedral of St. Helena, just to name a few. The City of Helena, Montana offers a Region Airport with service provided by Alaska Air, Delta Air Lines, and United Airlines as well as Exec Air Montana, a private, full-service FBO for smaller aircraft and private jets. Also convenient to the Property is Great Falls International Airport with good connections offered by Allegiant Air, Delta, Frontier, Alaska and United Airlines. Currently, direct flights are available to Denver, CO, Las Vegas, NV, Minneapolis, MN, Phoenix, AZ, Salt Lake City, UT and Seattle, WA. For up-to-date flight schedules and airport information, please refer to the airport website: www.gtfairport.com. Great Falls International Airport also has two fixed based operators (FBO’s) – Holman Aviation (www.holmanaviation.com) and Front Range Aviation, Inc. (www.frontrangeaviationmt.com). Both Helena and Great Falls are a pleasant 1.5 hour drive from Dearborn Canyon Overlook. The local area is comprised of traditional agricultural operations combined with recreational landowners. Situated within minutes of the Property are several of the most noted land forms of the Rocky Mountain Front – Twin Buttes, Steamboat Mountain and the stunning Dearborn River Canyon. This majestic panorama of rugged limestone peaks, sheer walls, towering reefs and deeply-cut canyons provides a viewscape like nothing else in North America. 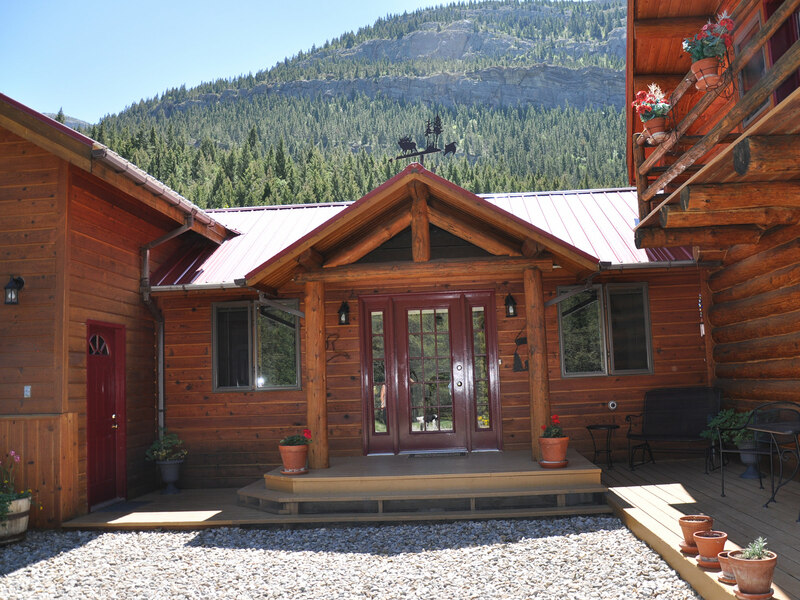 The Property sits at an average elevation of approximately 4,900 feet above sea level. The Property sits at an elevation ranging from 4840 feet above sea level near the northwest boundary to 5480’ on the southeast portion. Due to the surrounding mountains and the Dearborn River running through the core of the Property, the weather can change rapidly. The average annual precipitation is 13.74 inches, with the majority of the rainfall occurring in May and June. The average growing season in the area is approximately 93 days with frosts ending in early June and beginning in early September. Average high temperatures in June, July and August range from 72° to 81° Fahrenheit. In December, January and February average high temperatures are between 38° and 42°. Summer average minimum temperatures range from 45° to 51°. Winter average minimum temperatures are typically between 14° and 16°. There is plenty of sunshine throughout the year. The topography of Dearborn Canyon Overlook can generally be described as an alpine setting with strong water influences throughout. The Dearborn River is a significant geographical attraction as it cascades from west to east through the center of the Property, in places creating a deep canyon-like setting. The River is characterized as a healthy alpine stream on a moderate gradient creating riffles, pools & deep runs along a boulder and cobble bottom. 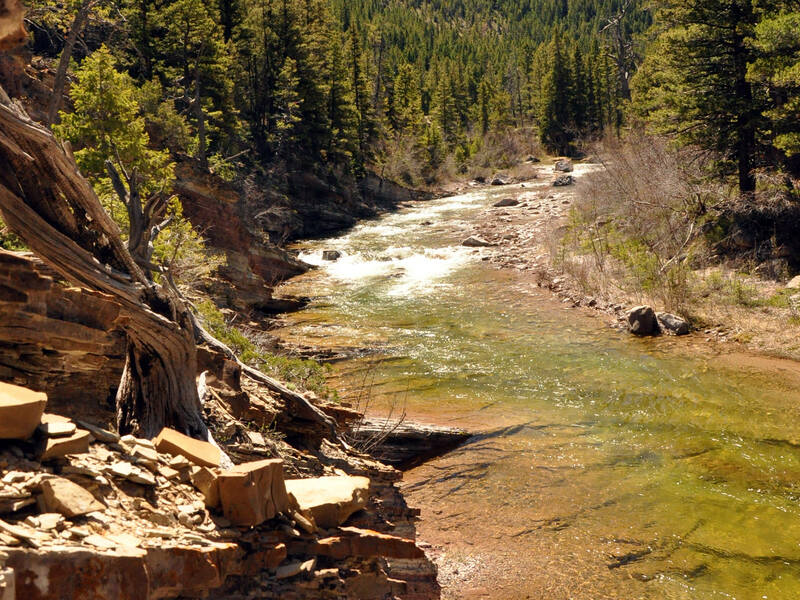 The River is bordered by healthy mature stands of pine trees that create a wildlife-rich riparian corridor. The upper portion of the Property consists of pine and aspen forests with a few flat benches interspersed among the trees below dramatic rock outcroppings. The Property also contains hills, open meadows and a small seasonal spring running along the west side of the house. 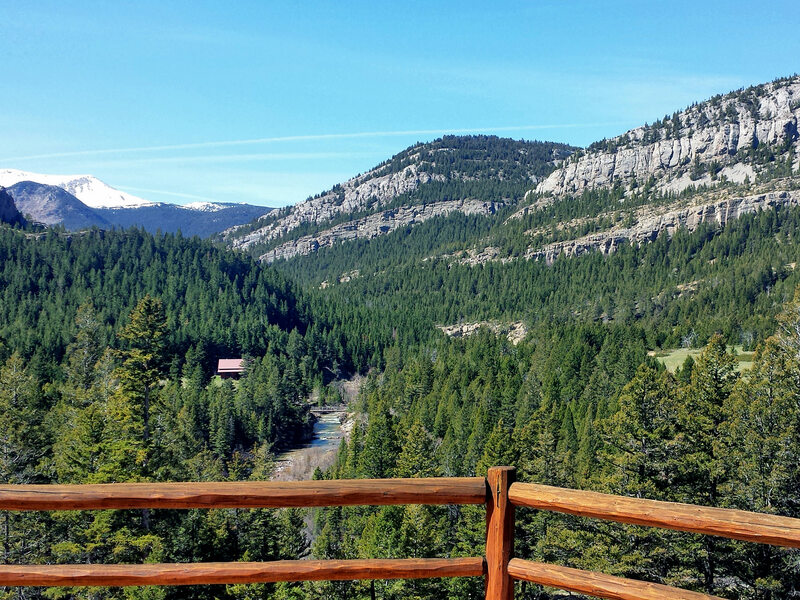 The views into the adjoining National Forest and Wilderness are unparalleled from the deck of the home allowing for true appreciation of the awe-inspiring landscape. Dearborn Canyon Overlook encompasses approximately 20 deeded acres with 850’ of private Dearborn River access and shares the south east boundary with the adjacent Lewis & Clark National Forest. The deeded land is generally classified as follows: 20± Total Deeded Acres of Alpine Forest and Meadow with a healthy Riparian Corridor and River Ground There is a landowner-use easement granting access through the Property to the United States Forest Lands via the Dearborn Trail #206. This trail allows for foot and horseback use only and users must stay on the trail and respect the adjacent private property. The Dearborn Trail connects with the Continental Divide National Scenic Trail ultimately arriving at Glacier National Park and the Canadian Border. The Seller will convey the Property without reservation of whatever mineral, oil, gas, geo-thermal, hydro-carbon and gravel rights which he actually owns, subject to reservations by previous owners. The owner holds a 25% share of the mineral rights with the remaining 75% owned by the estate of Warren Barrett. The Seller makes no representation as to the quantity or quality of any mineral or other subsurface rights appurtenant to the Property. Electricity is provided by Sun River Electric Cooperative based in Fairfield. Telephone and Internet service is provided by Three Rivers Communications via fiber optic lines. Propane is currently supplied by Breen Oil Company. Cellular phone service provided by Verizon is available via a Samsung Cell Booster. Water for the home is provided by a domestic well – at 200’ deep via a new well pump which was installed in 2013. The residence is on an individual septic system. Annual electric costs typically run about $1,344 and propane has historically been approximately $1560 per year. The real estate taxes for 2014 were approximately $1,590.00. 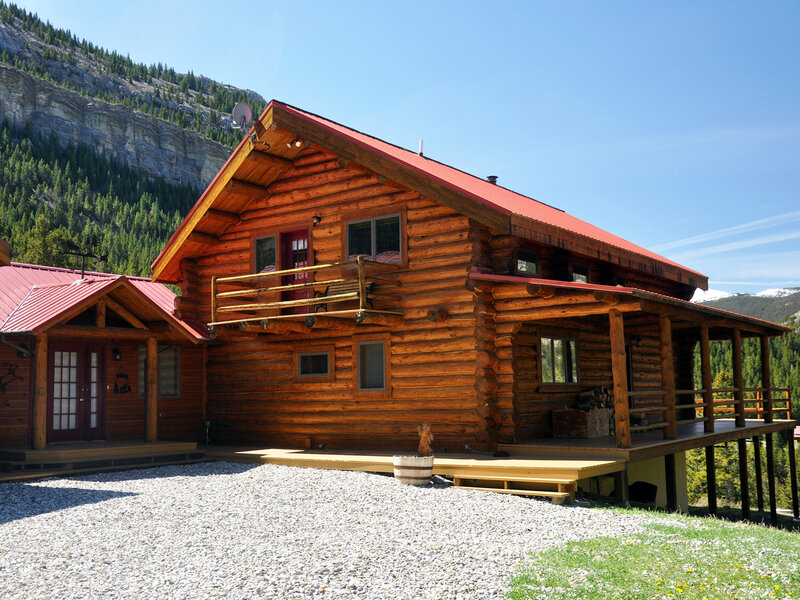 Originally handcrafted in 1988 by Frontier Log Homes in Bozeman, Montana, the pride of workmanship of the custom log cabin is apparent in the details and artistry throughout the home. From the joints featuring a Swedish Cope, to the full interior log midwall, to the built-in log bunk beds in the “bunk room”, the workmanship is superior. It only takes a moment after stepping onto the covered log porch and the wrap-around back deck to be captivated by the special setting. The placement of the home was perfectly positioned to embrace its Montana roots and blend into the forest landscape while maximizing the dramatic views across the horizon. The sounds of the birds and the rushing river below provide a natural soundtrack of tranquility. The back deck unsurprisingly becomes the focal point for entertaining and relaxing. Upon entering the home, your eye is drawn to the floor-to-ceiling logs in the vaulted great room and the perfect framing of the Dearborn River from the kitchen and the great room windows. A new Quadra-Fire wood stove provides heat and ambiance, and supplements the gas-fired Rinnai heater and gas-forced air Coleman furnace. Hand-made pine-wood flooring flows throughout the main level, kitchen, loft and entry. The kitchen, which is open to the great room, features new hickory soft-close cabinets, Livingstone solid surface countertops, Miele dishwasher, GE Profile gas range and convection microwave. The well-appointed master bedroom and bath are situated just off of the great room on the main level. Completely remodeled, the master bath is accented with custom cabinetry and very beautifully-installed travertine tile in the surrounding area and on the floor – lending a sense of understated luxury to the home. 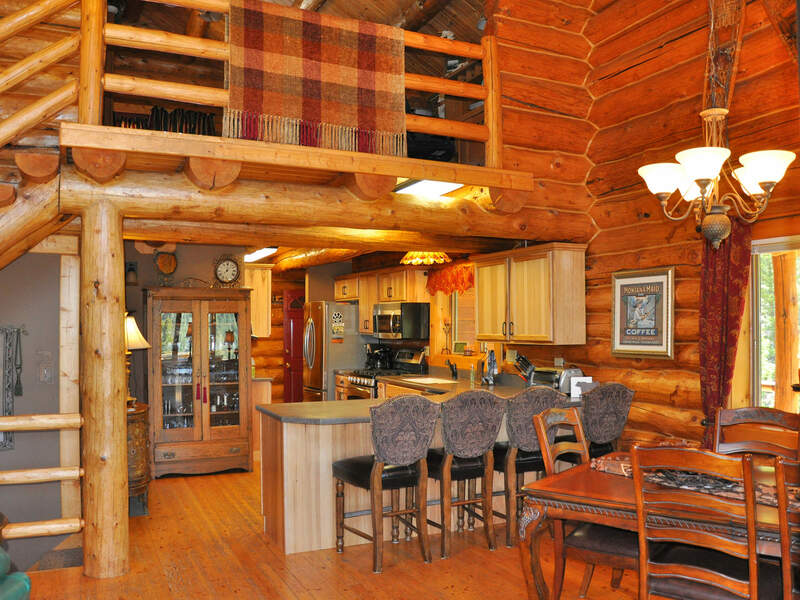 A handcrafted log stairway and railing leads to the upper loft area that lends itself well as an additional sitting area or office. A cozy deck off the upper level creates another area to relax and let in the mountain breezes. Just off the upper sitting area is the “bunk room” punctuated by built-in log bunk beds to accommodate additional guests. The walk-out downstairs area beneath the great room features a private entrance, a private sitting area, a well-appointed queen bedroom, a beautifully remodeled full bathroom and a separate office-den area. Also on the lower level is the mechanical room - impeccably laid out and maintained - as is the laundry room, featuring a Bravos washing machine and a Maytag Neptune dryer. Originally constructed as a summer cabin retreat, the owners became so captivated by the setting that they decided to make it their primary year-round residence. A tasteful addition was constructed in 1992 adding a walk-in kitchen pantry, a spacious front deck and entry with large dual walk-in closets. Also added was a fully insulated and heated four-car garage with work area and room for the additional chest and upright freezers. As an added bonus, the addition also incorporated a large sunlit room with a full bathroom above the garage. This room is currently used as a workout and recreational billiards and movie area but could also be utilized as an additional bedroom. A short stroll from the main house through the woods is the barn and shop built in 1997. The structure features exceptional storage, a dedicated 220-volt electrical panel, poured-concrete floors, a half-court basketball area, and scissor trusses to accommodate very high profile vehicles. Additionally, the entrance to the Property sits behind a handcrafted locked privacy gate and portions of the north and west areas of the Property are tastefully jack-leg fenced to enhance privacy. All of the improvements on the Property, including interior and perimeter fencing, are very well maintained. They are very functional and appear to reflect no large future deferred maintenance expenses. **The tasteful décor compliments the architectural design of the home, and many of the Main Residence furnishings and personal property could be purchased via separate Bill of Sale. The next owner will certainly appreciate the abundant and easily accessible outdoor amenities of north central Montana that fulfill the prerequisites of any recreation enthusiast. 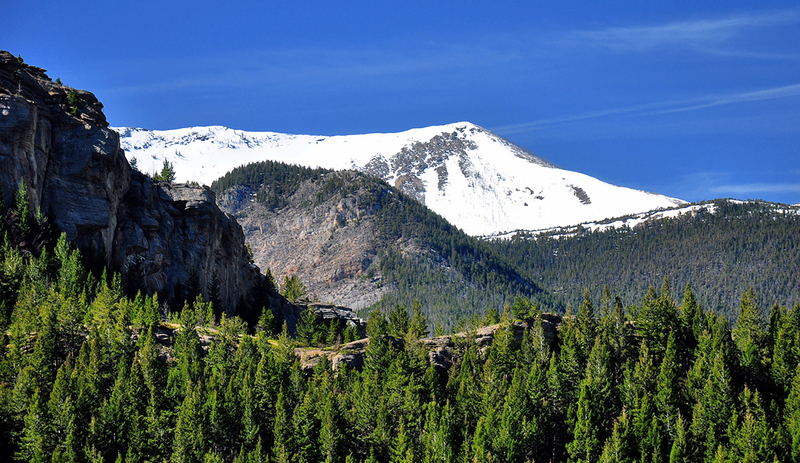 Bob Marshall Wilderness Complex situated just west of the Property is comprised of 1,535,352 acres. The sustained beauty of “The Bob”, the fifth largest wilderness area in the United States, is due in part to the Wilderness Act of 1964 which prevents any roads or structures from being created as well as motorized or mechanical equipment not being allowed in the area. The Rocky Mountain Front contains the top one percent of wildlife habitat remaining in the lower 48 states, with unmatched native plant and animal diversity. Its dramatic vistas include rolling prairies dotted with glaciated wetlands, jagged limestone reefs and breath-taking alpine landscapes. This area, that has seen very little change since Lewis and Clark hunted here in 1805, it is the only spot on earth where grizzly bears still wander out from the mountains onto the plains. The Wilderness is accessible by foot or on horseback through its abundant trail system. Hunting, fishing and camping are all allowed with the proper permits. Wildlife within the area includes grizzly and black bears, moose, elk, deer, mountain goats, bighorn sheep, wolverine, wildcats and lynx. For the fly-fishing enthusiast, the private river access to the Dearborn River will be appealing. The upper section of the Dearborn River offers plenty of action for rainbow and cutthroat trout. Since the upper stretch of the Dearborn River is located in the Wilderness, access is by foot or horse only. As this is a mountain stream, numerous pools, riffles and rapids are found all along this stretch. Fishing pressure is extremely low since the lack of road access keeps the vast majority of anglers away. The Dearborn Trail #206 parallels the river, allowing for excellent access for anglers willing to venture off the roads. The Property is a comfortable hour’s drive from the world famous Missouri River. Considered by many to be the world’s largest spring creek with some of the most consistent dry-fly fishing anywhere, the Missouri River is less than 48 miles from the Property. With a current trout population in the river below Holter Dam at over 5,375 per mile, the Missouri offers sport anglers endless opportunities for large rainbows and browns. Additionally, nearby Holter Lake provides good fishing for rainbow trout, walleye and perch as well as a scenic pleasure-boating experience. For the whitewater enthusiast, the Dearborn River offers exceptional seasonal whitewater kayaking. The next owner could utilize the private access to the river to begin or end a kayak excursion directly from the Property. Located in Montana Deer and Elk Hunting District 422, hunting opportunities exist on the Property itself as well as on the adjacent national forest land and within the nearby wilderness areas. Residents may purchase a general elk and deer license, and non-resident licenses are available in the General Big Game Drawing with licenses often available on a left-over basis. Dearborn Canyon Overlook is in the heart of Charlie Russell Country - featuring landscapes often depicted in many of his famous artistic portrayals of western life. In Great Falls, visit the CM Russell Museum, one of the nation’s finest museums of American Western art and the home of the most complete collection of Russell art and memorabilia in the world. For many decades, travelers have journeyed down the Missouri to see the inspirational rock formations and limestone cliffs. Scenic boat tours are available to enjoy the beauty that has changed little since the days of Lewis and Clark. To gain additional knowledge of the “Corps of Discovery” Expedition and the history of the area, it is well worth visiting the Lewis and Clark Interpretive Center in Great Falls which offers lecture series, films and exhibits and allows visitors to re-live the 1804-06 Lewis and Clark Expedition’s 8,000-mile journey across western North America. To the northeast of the Property, near the town of Fairfield, lies Freezeout Lake. While this Wildlife Management Area offers hunting, fishing and wildlife viewing, it is also the primary staging area for snow geese in their spring migration from the Gulf States. In early March as many as 300,000 snow geese and 10,000 tundra swans gather at the Lake to rest before continuing to the extreme northwest Arctic Coast of Canada. Positioned between the Pacific and Central Migratory Fly Zones, the mountains tend to push migrating birds east thus creating tremendous waterfowl hunting opportunities with the massive migratory populations. Fairfield also offers golfing at the Harvest Hills Golf Course with a beautiful backdrop of the Rocky Mountain Front. Golfing is also available at the Choteau Country Club, and Great Falls has several notable courses including Anaconda Hills, Meadowlark Country Club and the new Eagle Falls Golf Club. Located about two hours from the Property west of Choteau, Teton Pass offers both winter and summer recreational activities. With an annual snowfall of approximately 250 inches, this cozy resort offers varying terrain for skiing and snowboarding. In the summer, the amazing views can be enjoyed by hiking and biking the various trails. Each year on the last Sunday in June, the American Legion PRCA Rodeo takes place in Augusta. For over 75 years, the community has hosted the oldest and one of the largest rodeos in Montana, which draws the top rodeo athletes from around the nation. This annual event featuring a parade, Old-Time Wild Cow Milking and rodeo creates an exciting family affair. Lewis also noted the extensive timber in the drainage. Turn-of-the-last-century loggers worked the area, taking much of the ponderosa pine. Many pines, too twisty to mill, have grown into huge, gnarled sentinels that wave their branches from the surrounding hills. U.S. Army topographer P. M. Engel passed through in 1859 scouting the route for John Mullan’s military road. He described the remote timbered valley as difficult to maneuver, “…cut up by a great many sloughs and ditches.” Homesteaders later began to settle in the area with the completion of the Montana Central Railroad in 1887. Augusta, strategically located between Helena and Great Falls, became the local trading center. In 1889 Montana became a state, and four years later in May of 1893 the town site of Augusta was surveyed and dedicated. It was named after the first child born in the town, Augusta Hogan, daughter of an early rancher, D.J. Hogan. Built in 1897, the Dearborn River High Bridge, which sits a few miles to the south of the Property, provided critical access for homesteaders to the railroad in Augusta and Wolf Creek. Until the early 1930s, local farmers and ranchers transported goods and livestock across this bridge. This structure is the last surviving example of a pin-connected Pratt half-deck truss bridge in the United States. King Bridge Company of Cleveland, Ohio, tailored the design specifically to the Dearborn River Canyon to carry relatively light loads over the deep crossing. Lewis and Clark County and the Montana Department of Transportation restored the landmark bridge in 2003. The old Hollywood cowboy Gary Cooper owned a ranch along the Dearborn River, probably picked because of its otherworldly landscape. The little tributary of the Missouri River delivers towering canyons, volcanic geology and a Wild West atmosphere to those lucky enough to catch its floating season. About 30 years ago the Dearborn River played another role in Montana history, but most of the action took place in Helena. “It was one of the two pivotal streams that got us the stream access law we have today,” said Stan Bradshaw, a water-rights attorney for Trout Unlimited. In 1980, he was legal counsel for Montana Department of Fish, Wildlife and Parks when it got dragged into a court battle with two ranch owners who claimed anyone floating through their property was trespassing. The second challenge was on the Beaverhead River. In 1984, the Montana Supreme Court ruled on both cases, and found Montana has a very expansive stream-access law, grounded in the public trust doctrine. The public gets to use its rivers without regard to the ownership of the riverbed. The Legislature later codified the ruling to say river floaters, including camping, can travel freely within the high-water marks of a river corridor. However, most of the Dearborn is so narrow and cliff-bounded, there’s little shoreline or island space to raise a tent. 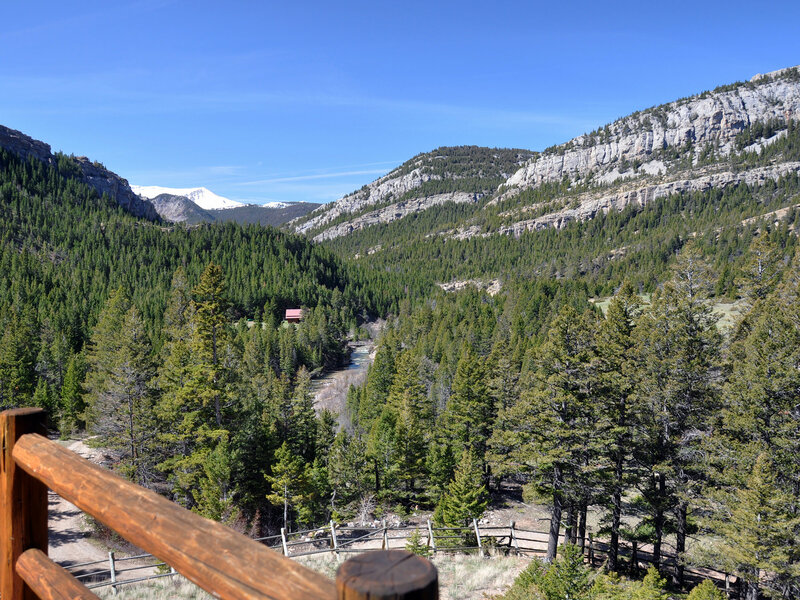 Dearborn Canyon Overlook, enjoying a premier location along the Rocky Mountain Front – one of Montana’s most desirable locales, is graced by stunning views and unrivaled recreational opportunities. The privacy and sense of tranquility the Property provides are highly coveted to those seeking solitude away from the masses of urban America. The current owners of the Property have done a wonderful job maintaining the quality and condition of the improvements. The absence of deferred maintenance on any of the buildings is readily apparent upon inspection of the Property. The overall simplicity of ownership of the Property is also very attractive. The current owner does live at the Property full time; however, the Property would lend itself well to either a full-time owner or as a part-time recreational property. The recreation and riding opportunities provided by the Property are unparalleled. 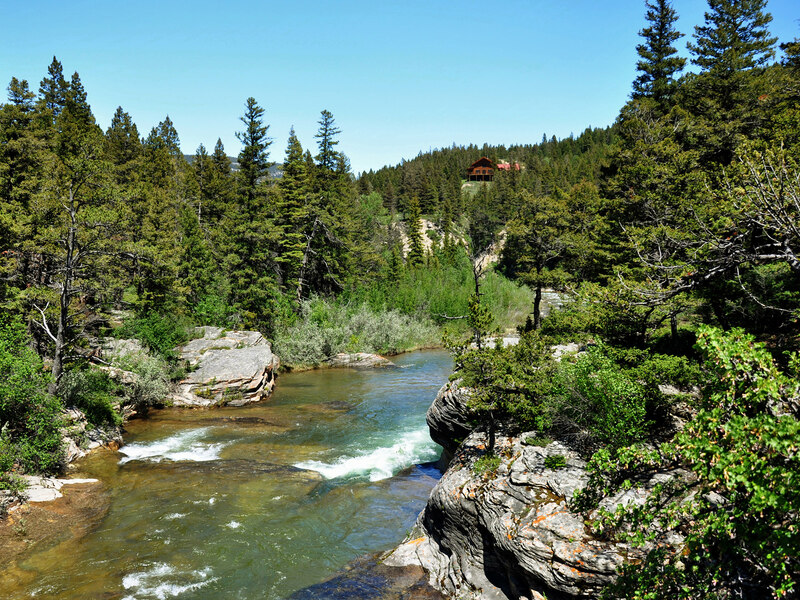 The vast trail systems of the nearby Scapegoat and Bob Marshall Wilderness Areas can be enjoyed directly from the Property as well as the private river access and excellent fishing with in steps of the beautiful custom log home. Rarely does a property that offers such alpine solitude, views, access to wilderness and access to private riverfront become available on the market. The next owner will be part of something special at the gateway of wilderness. **The tasteful décor in the improvements compliments the architectural design of the Ranch and much of the furnishings, personal property and equipment could be purchased via separate Bill of Sale.